The word focus has various meanings and connotations. Being both a noun and a verb, the word lends itself to many applications in the world of triathlon. As a noun, it means: the center of interest or activity. As a verb it means: to pay particular attention to. From a high level view, triathlon is ultimately the focus of activities. Further down, the endeavour can be broken into the various distances, from sprint distance all the way up to IRONMAN. As a verb, the word refers to the attention or amount of that attention to the sport as a whole, or to its individual components. 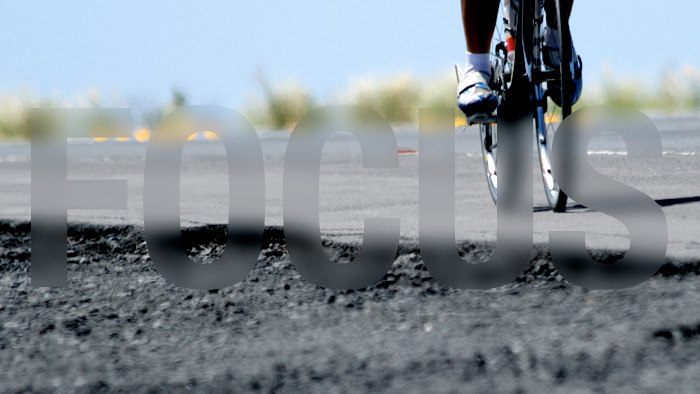 Even finer focus entails the individual movements that make up a sport such as the arms in swimming or legs in running. Focus applies to more than just knowing what your workout is and staying in the moment. It can alter based on the time of year, your technical and physical capabilities, and your experience. Here are my tips on how to apply focus in those key areas. The New Year has just begun and for most of you in the Northern Hemisphere, the ground is frozen, it might be covered in snow, and the first race is months off. At this point in time, since a goal race is even further in the distance, you should focus on your experience and immediate environment, not on your overall season. This is a time to practice good life habits in regard to balancing your work, social life, and training. By focusing on enjoying your workouts now, it will allow you to succeed when the training load gets significantly higher and your focus shifts to intensity and dealing with discomfort. Some athletes have the best intentions but allow busy lives to overshadow their weekly workouts. Others hit it too hard, too early and are burnt out by June. In February, the focus should be laying the groundwork for the season with emphasis on consistency, increasing overall fitness level, and having fun. If you are lacking some motivation, finding a group to train with that has similar goals could be an option. Switching sports can also help. Try the new sport of fat biking or go cross country skiing to build cardiovascular fitness. Changing sports also has an effect on what you focus on. Skill based activities like those mentioned above, and I would add swimming, requires added body awareness and helps to condition the body and mind to perform movements as a habit. Technically, focus should include an awareness of how your body feels and is responding to the gradual increase in load and volume. Pay special attention to any strength and conditioning requirements to protect you from injury. Also overuse or repetitive motion injuries are common if one builds too quickly. While emphasis is on a fun and enjoyable environment, it doesn’t mean all training needs to be slow. It has been my experience that interval work is beneficial year round. The elevated heart rate and increased effort maintains a level of form. According to research by Joe Friel in his book, “Fast after 50”, top end speed drops off as we age. Essentially, it’s use it or lose it. The focus of interval work changes throughout the year. Early season it is an excellent way to prepare the body for upcoming race specific work. After the slight detraining at the end of the season, intervals serve to get the mind and body working in harmony. Getting used to the discomfort that you experiences during 5 to 6 minute intervals will allow you to progress with the belief that the effort is ultimately maintainable and not to give up early. Times may be slightly slower than what an athlete may have seen at the end of the previous season, and this is normal. Consistency trumps peak performance this time of year. Having an idea of your baseline numbers such as maintaining 1:45 per 100m in the pool, holding 200 watts for threshold sets on the bike, or 7:00 per mile pace during intervals on the treadmill provides solid data from which to base future training. Performing clearly defined workouts and approaching each one with a sense of purpose, rather than just showing up, lays the foundation for a solid year. The level of focus in February will be different for a beginner than for someone who has been in the sport for years. Experienced athletes work with their coach to objectively look at the past season or seasons and identify areas that are ripe for improvement. Everyone has different needs. I often talk to my athletes who have not established an A race goal for the year about this. At this point, the aim is for consistency and workout completion. For a newer triathlete, the focus may be towards sport specific skill acquisition. Learning to swim properly is a good place for new athletes to start. Video feedback also helps reinforce proper body position and awareness. I often start working with athletes at this time of year who need to learn to run well. The focus is the body’s vertical alignment, efficiency, and cadence. Knowing what to focus on and working with “broad strokes” in February and March will allow the athlete to progress to the laser sharp focus required during race season.